You will have read in Lisa’s report about Hugh’s over 90 record, but you may not have realised that Hugh was actually the fastest man running at Hove Park on that Saturday. In fact, of the almost 20,000 runners that has graced our parkrun only Olympians Tim Hutchings, Andy Baddeley, Richard Nerurkar and Rob Mullett have run faster during their careers. 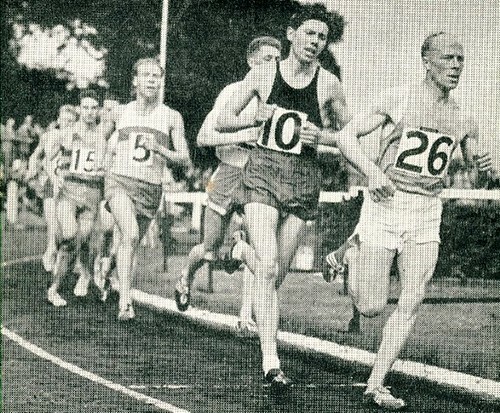 In 1956 Hugh won the Southern 3miles track title (see photo above) in 13:35.2 on cinders, a time equal to around 14:03 for 5000 metres or 5k. Two years later his 28:16 for 6 miles on the track equated to approx 29:16 for 10,000 metres or 10k. In 1956 he was desperately unlucky not to make the Olympic Games. The three British representatives in the 10,000 metres finished 5th, 8thand 10th. Hugh, as the next selection possibility would have been in Melbourne if he had been from any other country. Ken Norris, the runner wearing 10 in the photo was actually the 5thfinisher in the Olympics. Also in 1956 Hugh was second in the International Cross Country Championship, which at the time was mainly European, but later became the World Championship. He also appeared for Britain in several two country international track matches, plus an England appearance in the 1958 Commonwealth Games. That covers the big stuff, but my association with Hugh starts in the same year of 1956, when as a 19 year old RAF National Service Radar Operator I had the good fortune to be posted to the RAF Truleigh Hill radar station and be billeted in Shoreham. Most of my colleagues wanted to be posted near to home. All I wanted was to be posted near to a decent athletic club. Brighton Athletic Club, as it was then, had a very strong distance section in which Hugh was a massive inspiration. Unlike many top runners today, Hugh appeared in practically everything that the club was involved in, track, road or cross-country. He always appeared at Withdean on a Tuesday evening and dragged several of us round sessions that look pretty advanced for 60 years ago. He would potter round with us while we were running our socks off with sessions such as 6 x 880yds (800 metres) in 2:14 average, with 2 laps recovery, and 10 x 440yds (400 metres) in 69-70 secs average, with just 100metres for recovery. These were pretty light sessions for Hugh and I used to think that this was his ‘easy’ day among 6 much harder ones. I learned later that he had been out for a quick 10 miles before breakfast! In those days road and cross country relays were more popular than nowadays and clubs ran about 10 of these events each year. There were prizes (usually domestic items) for the first 3 teams rather than medals. Hugh always ran the 4thstage. The first 3 had to do their best before Hugh scythed through the opposition to hand over in the first three, often in front. The last two (sometimes I was one of them) had to do their best to stay in the first three and go home with a table lamp, a holdall, a pair of sheets, a set of fruit bowls or something similar. Somewhere in the early 1960s Hugh stopped running seriously to get his accountancy career established, but returned to win quality veterans events and set age group records. He has run and raced continuously ever since, as you saw on Saturday. His 80-84 record of 28:31 on the not too easy Hove Park course is particularly impressive, as is the 85-89 record of 36.52. Hugh’s aim on his 90thbirthday was to run 50 minutes or less and he did just that with a time of 49:13. So, watch this space. Next step 95-99 record? The one with significant birthdays, an age-bracket course record and glorious spring sunshine – what more could we ask for?! Where to start? Part of me keeps thinking back to this morning and all I can think is “WOW!” It was a perfect spring day in Hove Park – hardly any breeze, warm sunshine (I could see runners and volunteers shedding layers left, right and centre), the blossom was looking spectacular and our friendly woodpecker was busy in the trees above us as well. This week we celebrated our 600th run at Brighton and Hove parkrun – how lovely it was to see that chalked on the start and finish lines. Just think, since 3rd November 2007 19,565 participants have completed 194,404 parkruns covering a total distance of 972,020 km, including 32,472 new Personal Bests. And a total of 1,622 individuals have volunteered 13,614 times. Give yourselves a round of applause… oh, that’s right, we did! Well done to Run Director, Bernie Kirraine, for the epic announcements including leading us all in a chorus of ‘happy birthday’. Of course, we weren’t just celebrating a parkrun birthday, but also the 90th birthday of a running legend. “Oh in the past I would have done it in about 14 minutes, and I’m hoping to do about 50 minutes now” – Hugh Foord. How many of us could even imagine making such a statement on our 90th birthday? But Hugh did indeed complete 5k this morning in 49:13 and proudly wearing his Brighton and Hove City AC vest too. Obviously, Hugh is awesome and I could fill this report with his many incredible achievements. However, I’m going to leave that to another legend – Roy Taylor – who is providing a special supplementary report this week. But from me and all the core team: a very happy birthday, Hugh, and congratulations on setting the course record for VM90-94! This morning 524 people ran, jogged and walked the course, of whom 54 were first timers and 76 recorded new Personal Bests. Representatives of 28 different clubs took part. For today's full results and a complete event history please see the Brighton & Hove parkrun Results Page. But in the meantime, until next Saturday, keeeep running! Spring was definitely in the air with benign temperatures as 435 runners gathered at the start in bright late March sunshine – but I couldn’t encapsulate it any better than A. E. Housman’s beautiful 1896 poem above. I thought this would be the perfect tribute to one of the parkrun family, and a former Hove Park regular, John Henry Ramsden who passed away this week at the age of 86. Mostly due to his advancing years, he most recently ran on the easier (if it’s not too windy, that is!) Hove Promenade course, but 225 of his 307 parkruns were at Hove Park. John’s parkrun journey started on 26th July 2008, and his last run was on 10th February 2018. He perfectly embodied the parkrun ethos; always friendly, smiling, courteous, and hugely supportive of other runners. John also volunteered his services on 56 occasions. Whilst he will be greatly missed by us all, he will be fondly remembered as a ’real gentleman’ – and I’m sure my parkrun committee members will pay their own tribute to John before our 600th run next Saturday. We had perfect calm conditions for running this week. There were 26 new runners to Hove Park, of whom 12 were parkrun ‘virgins’. I hope you enjoyed it and that you will become regulars – either here or at any of the multitude of parkruns around the world. Spring must have been in everyone’s step too, as an amazing 58 PBs were recorded – that’s over 13% of all participants! Local athletics club Portslade Hedgehoppers were out in force for their Super Series races with 25 members taking the field. Now onto the ‘scores on the doors’. For the women it was Hedgehopper Geraldine Moffat (VW55-59) who took the spoils with a PB in 19.46, going sub-20 minutes for the first time at Hove Park, shaving an impressive 56 seconds off her previous fastest time of 20.42 set in May 2018. Then it was Tori Miller (SM25-29) setting another PB of 19.51 bettering her hitherto fastest time of 20.50 by 59 seconds; followed by Kelly Tingley-Russell (SM30-34) in 20.27. Amongst the men Tim Lodge (SM25-29) of Arena 80 AC was first finisher with another PB – an almost two-minute improvement to finish in a fast 16.54; who was hotly pursued by Oliver Hamson (SM25-29) with another PB on 17.01; and Luke Hunt (VM40-44) of Harrow AC in north-west London finishing in 17.14. On the age-grading front it was the aforementioned Geraldine Moffat recording an impressive 90.39%; then another Hedgehopper, Stewart Gregory (VM50-54) with 86.31%; and Penny Retter (VW70-74) on 86.19% - and achieving a PB time of 27.38 to boot! Finally; we welcomed a fair sprinkling of visitors from far and wide. Amongst these we had Stephen Howard (VM55-59) of Ely Runners whose home run is in Cambridge; Andrew Thompson (VM45-49) from northern Ireland who often strides out at Waterworks parkrun in Belfast – but has run at over 100 other venues! Lucy Booth (VW45-49), a regular at Portsmouth Lakeside (but has run at over 50 other courses); and Catherine Radford (VM55-59) who hails from Tilgate parkrun, but is often seen in the New Forest at either Brockenhurst or Lymington parkruns. That’s all for another week. See you all again soon – and happy running! This is the unique run where we allow the parkrunners to circle the Hove Park in a clockwise direction. This gives the participants 3 nice long downhill stints with 'only' a short uphill section (*2) at the North of the course. Running it in the reverse, the opposite, direction is a nod to my Irishness, having been born in Dublin and still holding a Green passport, something that has recently become prized possession with the political situation as it is at the moment (No mention of the B word!). Along with Dee we had quite a multitude of Green wearing parkrunners. There were 31 runners that qualified for the 250 club that could of worn their green 250 shirts. No Pats running but a couple of TIm's ! Looking over to my home country I see the parkrun family started in 2010 in N Ireland and 2012 in Eire and now has over 100 events taking part each week. I did visit St Anne Wells Garden in Dublin and, as you would expect, a very friendly welcome was received and the vibe was typically parkrun. This week we welcomed tourists from Birmingham, Bristol, Aldershot, Norwich, Newcastle and from a Lonely Goat (apparently an Online club). The parkrun spreads out all over. In keeping with the green theme the first runner home (with a barcode!) was a Brighton & Hove youngster originating from Tipperary - Well done Kevin Moore. There were 482 finishers this week. If the following would like to reclaim their missing version please see one of the management on Saturday morning. A390890 Corrina SAFEIO; A1889763 Ronnie SMITH ; A1931008 Gary ETTRIDGE and finally A39026 Joy DOBBS. Well I hope you enjoyed the Irish run in the opposite direction and look forward to our 600th parkrun in a few weeks. Having been a parkrun tourist for quite some time now, there have been a cluster of parkruns I’ve wanted to ‘strike off’ for a good number of months, all lying in a concentrated area within the boundaries of Brighton city centre. During the past few weeks, including today, I’ve completed three of the five Brighton based parkruns, leaving just two to fulfil, Preston Park and East Brighton. On January 19th, my fellow tourist, Matthew HANLON, and I visited Bevendean Down, where I achieved my best ever finishing place of 4th, along with my second ever 1st in age category. Last weekend, another fellow tourist, Neil GODDARD, joined me to visit Hove Promenade, so it only seemed right to visit Brighton and Hove this morning. Unfortunately, Matthew couldn’t make it so it was with Neil that I set off from the Havant area at around 07:20, to make sure we arrived in good time at Hove Park. Hove Park, where Brighton and Hove parkrun is held, is a public park covering 40 acres. Facilities within the park include a fenced-off playground, a football pitch, a basketball court, a climbing boulder and several tennis courts. A paved path, approximately 1.89km in length, is the main route of the parkrun and is often used by walkers, dog walkers and runners, outside of the free, weekly, timed 5km parkrun which takes place every Saturday at 09:00. There are also several paved paths that traverse sections of the park at various points, one of which, affectionately known as, ‘Wiggly Path to Finish Go Go Go’, is part of the first smaller loop of the parkrun. In addition to some of the interesting facts I’ve already mentioned; Premier League’s Brighton and Hove Albion’s traditional home, the Goldstone Ground, once stood on Old Shoreham Road, opposite Hove Park, up until being demolished in the late 1990s. Its two biggest claims to fame (if you’re a general sports fan) was that on the 23rd September 1992, David Beckham made his professional début, coming on as a substitute for Manchester United in a League Cup second round tie. The other claim is that the ground hosted some of the football matches for the 1948 Olympic Games. Fingermaze; a labyrinth-like design based on a fingerprint which consists of stones set into the turf. By now, you’re probably thinking how can so much be crammed into what would appear to be a small space? The answer? Everything within is brilliantly set out... I may as well quickly mention the 2,000ft long miniature railway which operates on occasional weekends and bank holidays throughout spring, summer and autumn, which is run by the Brighton and Hove Society of Miniature Locomotive Engineers! their first ever parkrun. That’s a phenomenal figure for this time of year, so a huge well done and welcome to the parkrun family! Statistics today saw Adam Oliver WHITMEE cross the line as first male finisher in a time of 17:50, recording a new PB in the process. Bethan MALE was first female finisher, also gaining a new PB in a time of 19:43, so a massive well done to the both of you. Huge congratulations go to both Kevin WALKER and Gordon LUNAN for hitting the 50 parkruns milestone. For any of you who have begun to stalk my run reports, you’ll know that I always include other notable finish times, so here they are... Mark STEPHENSON finished in a perfectly rounded 22:22, whereas Zoe OAKMAN finished in an aesthetically pleasing 29:29 as did Natasha WALKER in 34:34 and Yao HU in 48:48. There were a handful of palindromic finish times too... both Alexandra SUTTON and John ELBOURNE in 30:03 and Richard A CARTER in 34:43. Once Neil and I had finished our spot of tourism, we headed off to Hove Park Café for a hot drink. It has to be the trendiest post-parkrun café I’ve ever visited... even though I have experienced ‘The Bevy’, an excellent community-run pub which has become part of the Bevendean Down parkrun culture in Brighton. Hove Park Café serves a huge array of sweet and savoury snacks, a plethora of hot drinks and a multitude of healthy alternative food, including (so as not to be gender specific) gingerbread people. I must also mention the the fantastic plastic figure of Godzilla devouring a felt-made Pink Panther, which stands on top of the counters as you walk in, coupled with the magnificent helping of ambient dance music pounding within the café. spooky... today was my 69th different event... there were 69 PBs recorded at today’s parkrun. Last week, at Hove Promenade, I finished in a time of 23:23, in 85th place overall and was 10th in my age category. Today, I finished in a time of 23:22, in 84th place and was 9th in my age category. You may have suggested that I should have bought at least one Lottery ticket tonight. I would have done, only I wanted to write this Run Report, so I’ll never know whether my spooky luck would have continued!